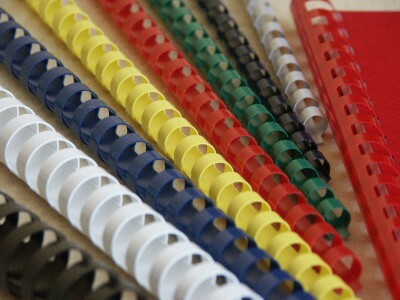 Binding Combs 20 Ring are a popular form of in-house office binding used due to their ease of use, economical pricing, availability and wide range of colours. Popular with Copyshops and Corporate Printrooms due to the shorter length than standard 21 Ring Binding Combs. 20 Ring Binding Combs are used when customers want the document spine not to match the length of the A4 paper. This looks neater and also prevents damage to the Comb Spine when documents are stacked upright on a book shelf. As one of the oldest forms of office binding, having been in use since the 1950’s, Comb Binding allows the user to bind from 1 to 375 pages. Meter Australia also has a large range of Comb Binding Supplies and Binding Covers that can be used will all brands and models of Comb Binding Machines. Binding Combs 20 Ring are used when your A4 page is punched with 20 holes. Meter has one of the largest ranges of Binding Combs 20 Ring available, including 16 sizes and 4 colours- Black, White, Blue and Red. Other Colours are also available on request .Click on the links below for more information and pricing on each Binding Combs 20 Ring size. Binding Combs 20 Ring are used in conjunction with a Comb Binding Machine. Pages are punched and then the Binding Comb is placed on the Binding Machine Comb opener so the comb can be inserted into the punched holes. The comb opener is then closed and the document is bound. With most good quality Comb Binding Machines large documents can be bound by leaving the comb open and punching sheets and continuing to insert pages. Comb Binding Covers can also be used to protect the front and back of your document.